Singapore’s Medical sector has long been recognized as the best in Southeast Asia, with many from across the region choosing to travel to Singapore to seek treatment and therapy. The city-state is looking to take this a step further by consolidating its position as a center for medical technology innovation. Global medical technology companies are setting up shop at dedicated facilities established by the Singapore government for medical and biotechnology such as Biopolis, the Medtech Hub, and the Tuas Biomedical Hub. Singapore’s biopharmaceutical industry grew by 30% during 2011 and further growth is envisaged. At MTA2013, Asia’s premier precision engineering trade show, a new hub, the Capabilities Hub, will be unveiled. This facility is being established to meet the needs of local and international companies serving the precision engineering industry. Apart from the medical sector, this industry supports the aerospace, complex equipment, as well as oil & gas sectors. Companies in the medical, pharmaceutical, and chemical sectors are also expected to continue hiring throughout the year, according to the Robert Walters Global Salary Survey 2013. With a dynamic and highly skilled labor force, company registration in Singapore continues to be an ideal strategy for multinational companies looking to establish their presence in these exciting industries. You may have read our recent post about Singapore’s burgeoning jewelry sector. The Singapore government sees the potential of this sector and is considering developing the city-state into a regional jewelry hub to capture the wealth of Asia’s elite. It has created a number of initiatives and incentives to allow the local jewelry industry to build on their design capabilities. The Productivity & Innovation Credit scheme is one example that funds design research and the development of new collections, the removal of the 7% Goods and Services Tax on the import of investment-grade precious metals is another. Though it serves as a regional hub for many industries (financial services, transport, logistics, and high-tech, to name a few) the fact remains that Singapore is a very small country with limited space that means it is difficult to set up large-scale manufacturing operations on the island. To overcome this, many companies based in Singapore have been setting up part of their operations in Iskandar Malaysia, a special economic zone located in neighboring Johor Bahru. The governments of both Malaysia and Singapore have encouraged investment in this region, which has been touted as a complementary space for development, rather than a direct competitor to Singapore. The Singapore and Malaysia economies have moved towards greater integration and cooperation, with Iskandar Malaysia being one of the fruits of close ties. Those who wish to set up their businesses in Singapore can gain from the flexibility that Iskandar Malaysia provides, while still being able to reap the benefits of incorporating in Singapore’s very business-friendly environment. For many years, tourists may have seen Singapore as a stopover city for a couple of days, or just a few hours in between flights. 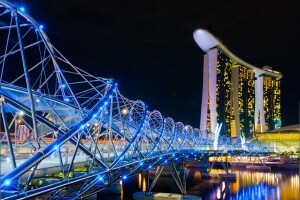 In recent years, however, Singapore’s tourism industry has transformed itself into a leader in recreation and culture. The city-state now boasts two casinos, a Universal Studios theme park, a water park, an aquarium with the world’s biggest observation window, as well as venues for concerts and Broadway musicals. Combine these with Singapore’s everlasting reputation as a retail and culinary hive, a week seems barely enough time to explore the new attractions that Singapore has to offer. During 2011, a quarter of the SGD22.2 billion spent by visitors went to sightseeing and entertainment, a rapidly growing segment that expanded 37% from the previous year. So whether it is the space industry, the biopharmaceutical sector, oil & gas, logistics, medical tourism, jewelry or just the staples of shopping and food, Singapore’s planning seems focused on being at the forefront of technology and providing the infrastructure and incentives to attract a broad array of business and consumer to it’s shores. By doing this, Singapore’s success in future years can rely on a diverse range of industries.